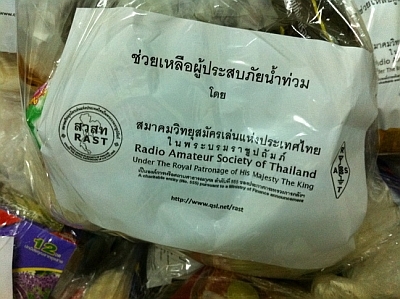 Survival packages from the Radio Amateur Society of Thailand and purchased with members' donations were packaged at the home QTH of Champ, E21EIC and are ready for distribution in November 2011. 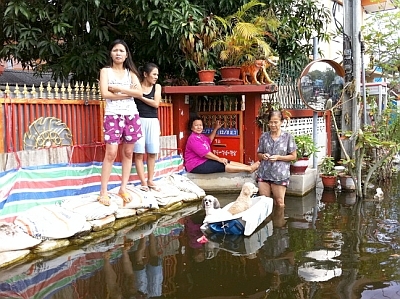 The pictures on this page convey some of the hardship that severe flooding had inflicted on the people of Thailand in late 2011 and depict the sacrifices that many volunteers have made and are still making to help those who are stranded in their homes. 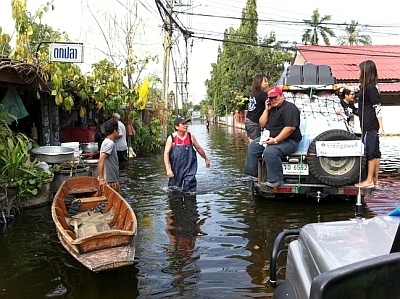 Many of those who helped out in the crisis were radio amateurs. 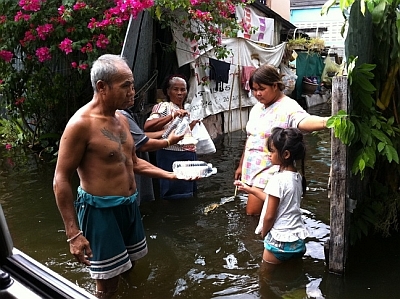 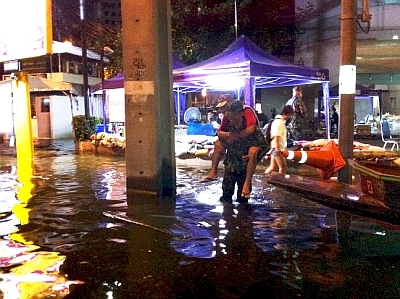 As of November 30, 2011 at least 661 people were confirmed dead and three were missing as a result of the flooding since July that year after a series of heavy tropical storms overwhelmed rivers and canals, delivering around 40 percent more rain than the annual average. 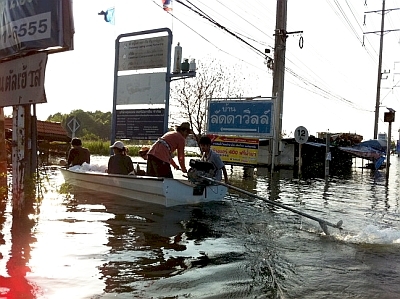 Millions of people have had to evacuate their homes after 58 of Thailand's 77 provinces were flooded, including seven major industrial estates that were inundated by as much as three metres of flood water, while the loss of crops and livestock has been enormous. 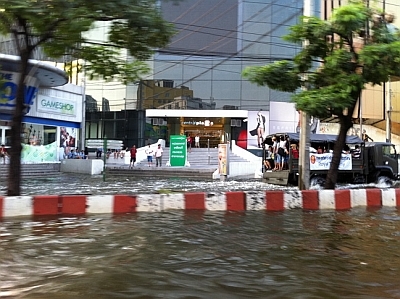 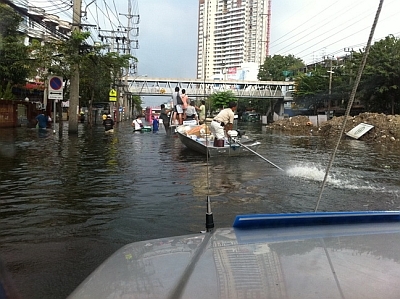 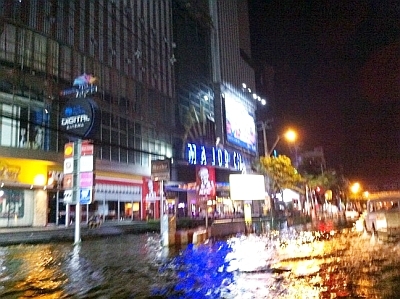 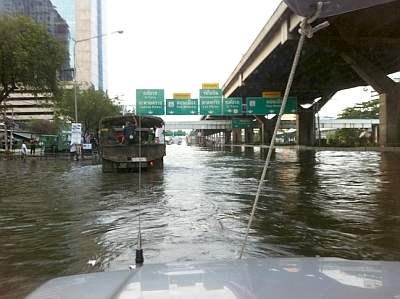 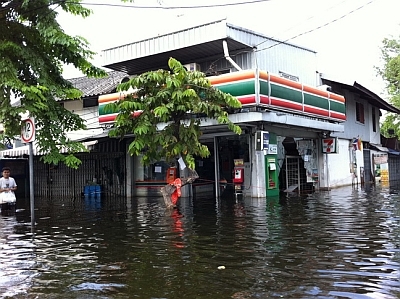 The capital, Bangkok, was not spared and many of its suburbs were under a metre or more of flood water, although the authorities managed to keep the water out of the main commercial district of Bangkok using dykes and by diverting the huge mass of water to rivers and canals that lead to the sea. 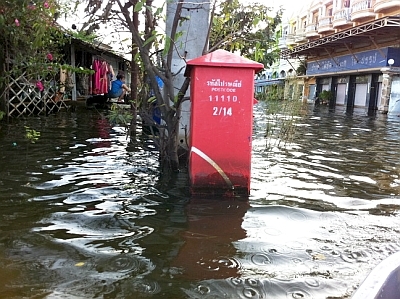 According to the Thai Government's Disaster Prevention and Mitigation Department, in late November, 2011 floods still prevailed in Bangkok and 14 other provinces, affecting 4,827,958 people (Bangkok Post newspaper, November 30, 2011). 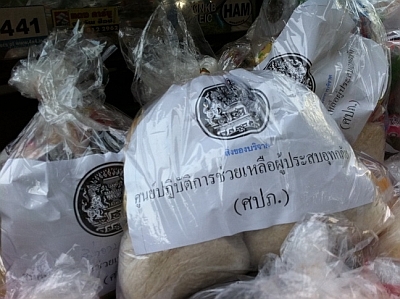 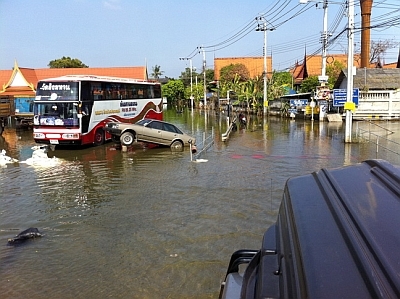 The provinces were Nakhon Sawan, Chai Nat, Angthong, Ayutthaya, Lopburi, Saraburi, Suphanburi, Nakhon Pathom, Pathum Thani, Nonthaburi, Samut Sakhon, Samut Prakhan, Nakhon Nayok, Chachoengsao and Bangkok, said the department. 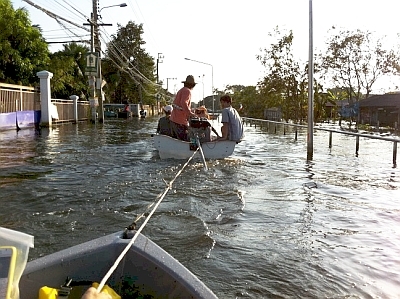 radio has been helping in this crisis in many ways, notably with communications and as of the beginning of November almost 1,000 lives had been saved by operators using the RAST club station callsign HS0AC and working with the Ministry of Public Health. 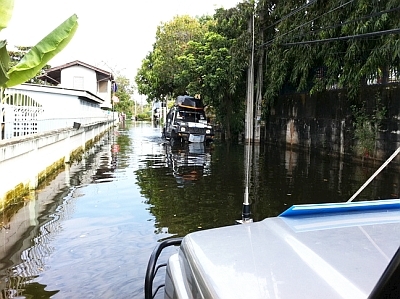 A special centre established by the National Broadcasting and Telecommunications Commission (NBTC) using the callsign HS0AB has been set up at the Government's Flood Relief Operations Command (FROC) and amateur radio VHF repeaters have come in very useful for emergency communications in areas where mobile cell phone towers have been experiencing problems. 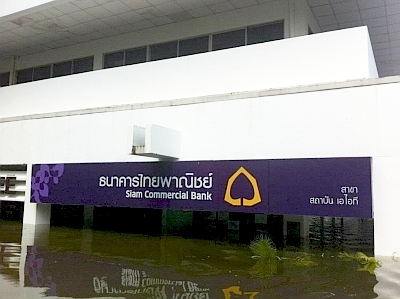 With the exception of the picture at right that shows the Siam Commercial Bank branch at the Asian Institute of Technology where the RAST club station has been inundated along with the rest of the campus, the pictures on this page were all taken by Chalermpol (Champ) Muangamphun, E21EIC. 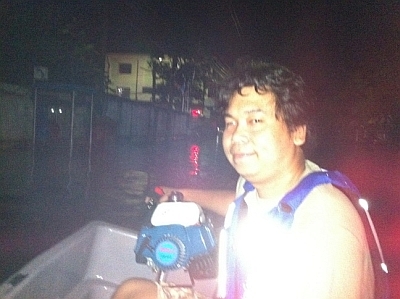 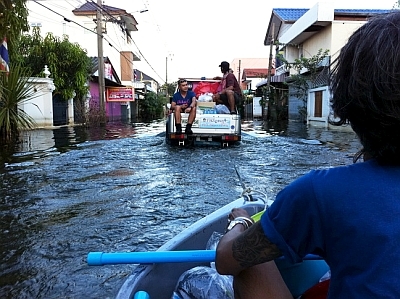 Champ is a committee member, the QSL Manager and the registrar of RAST and he has been engaged in relief expeditions with his wife, Goi, E20NKB, on a day-to-day basis into the badly-flooded areas around Bangkok. 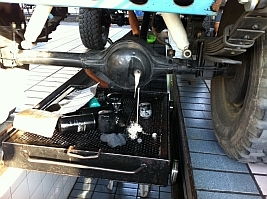 Churning through flood water on a daily basis means that gearbox and rear axle oil has to be changed frequently. 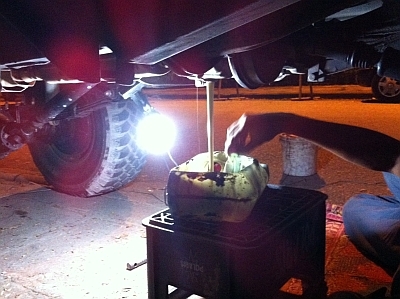 Here, the oil is changed on Champ, E21EIC's Suzuki 4x4 (that you'll see in several photographs below) on the night of November 28. 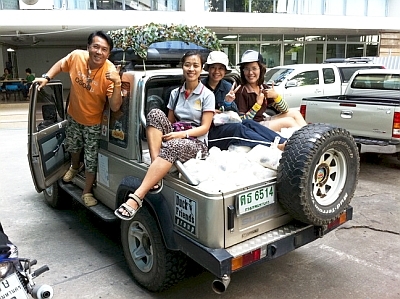 RAST sponsored this trip with a donation of 10,000 baht and the convoy visited Bang Bon, Buddhamonthon Sai 5 in Sampran District of Nakhon Pathom, Don Wai Market (Nakhon Pathom) and Orm Noi in Samut Sakhon. 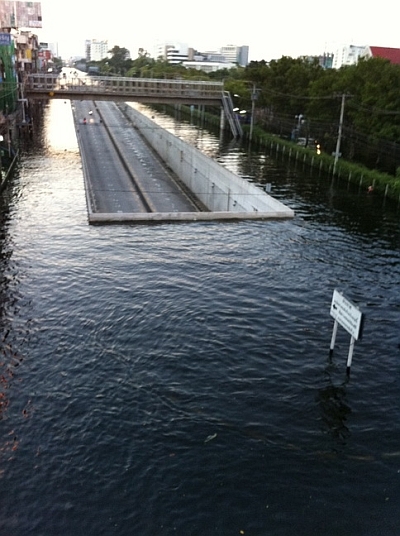 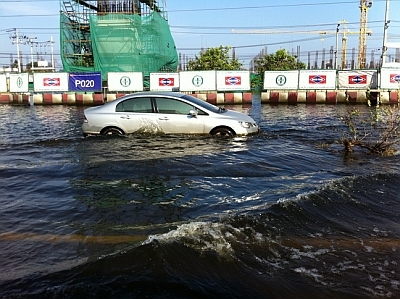 The water level encountered was 60 to 85 cm deep. 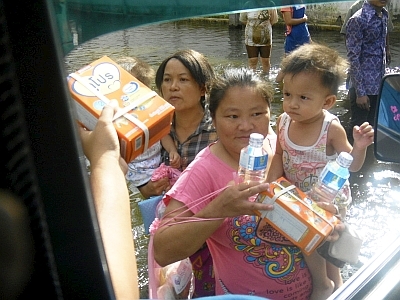 A total of 600 boxes of ready meal, 2,500 bottles of drinking water, powdered milk for newborn babies along with UHT milk, snacks and medicine was distributed. 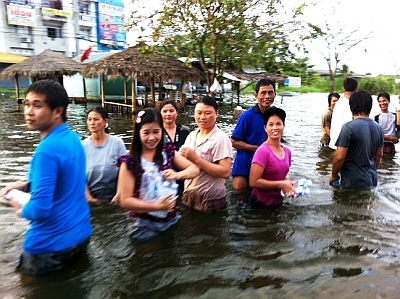 In Orm Noi, Samut Sakhon, the team helped many Burmese people. 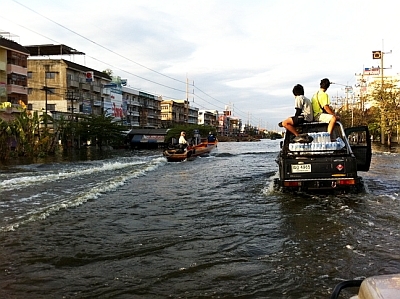 This outing lasted from 10 a.m. in the morning until 1 a.m. the following day, according to Champ, E21EIC. 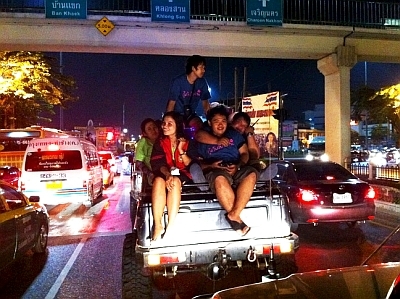 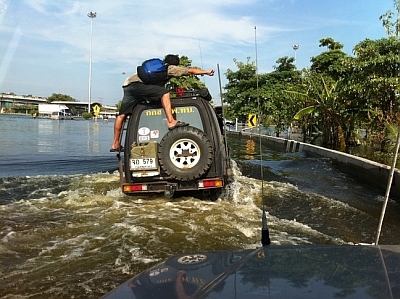 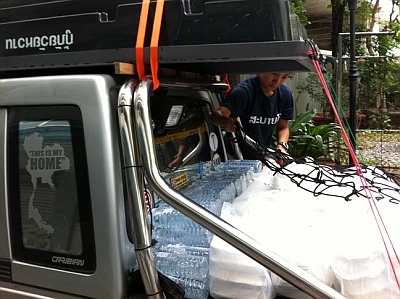 On November 20 it was RAST's turn to help flood victims when a team of 10 Suzuki 4x4 cars set off from Dhonburi Rajabhat University for Buddhamonthon Sai 3 and Buddhamonthon Sai 4 to the west of Bangkok. 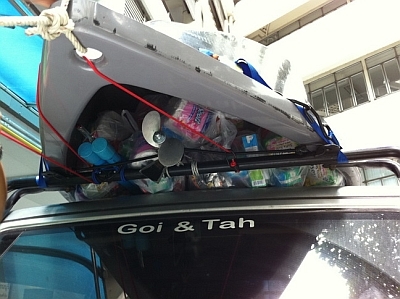 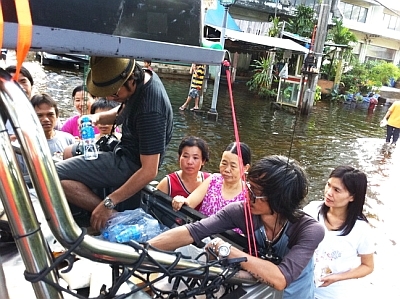 Many volunteers joined this expedition, including the Chanthaburi Rescue Team led by HS2TEI (the APRS East Group) with the support of three big boats and there were a total of 11 hams in the group, along with volunteers from Dhonburi University. 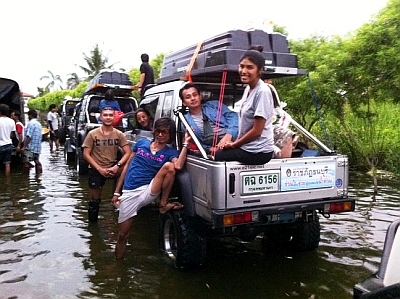 RAST Secretary Wacharaphol, HS4DDQ, joined in on this expedition. 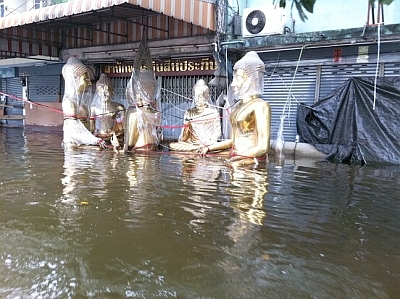 The flood water in Buddhamonthon Sai 3 and Sai 4 roads was between 70 cm and 120 cm deep and a total of 200 survival packages, including the 60 packages prepared for RAST by Champ and his team, were distributed, along with 2,000 boxes of food and 8,00 bottles of drinking water and medicine. 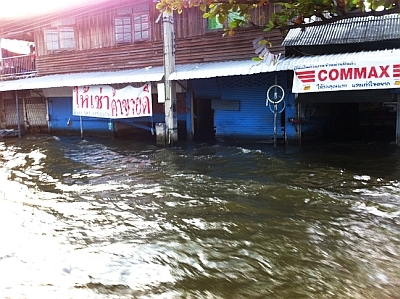 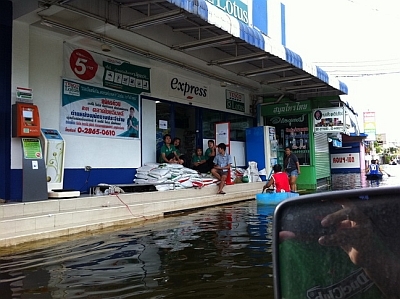 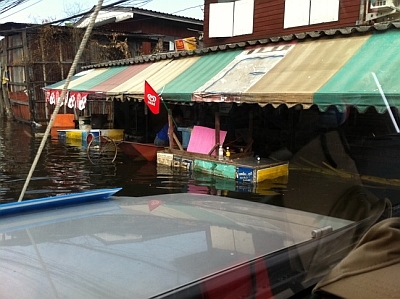 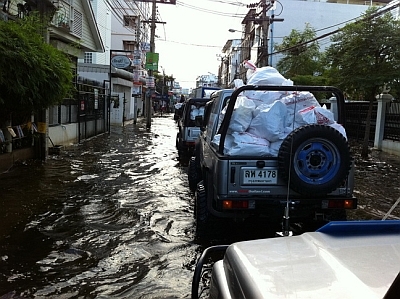 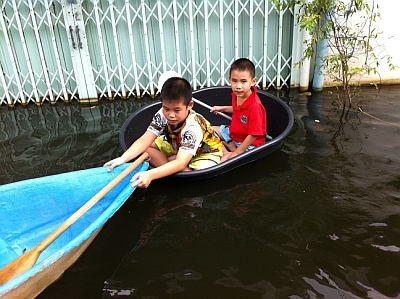 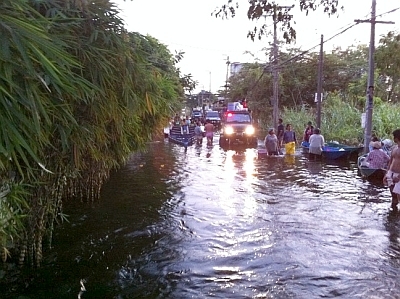 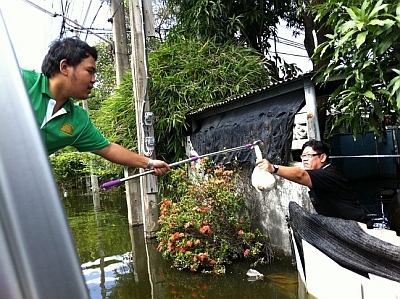 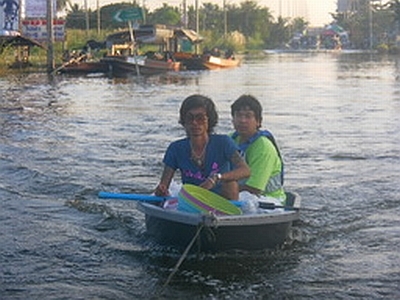 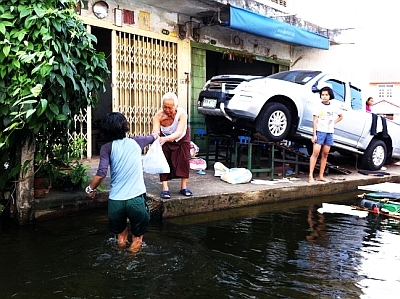 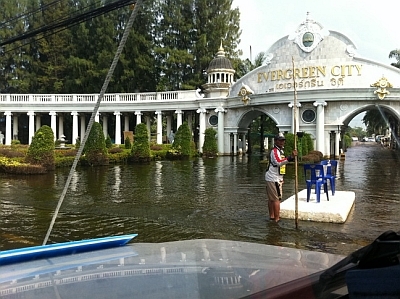 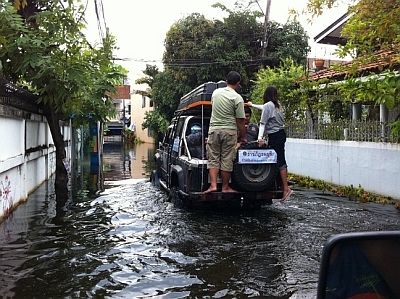 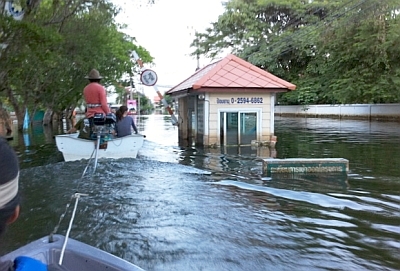 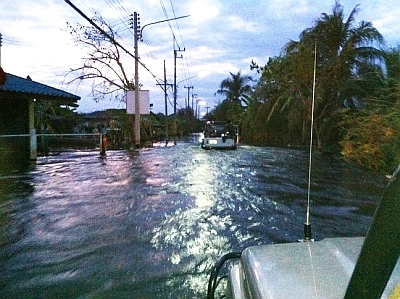 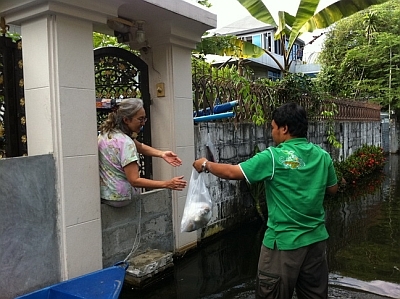 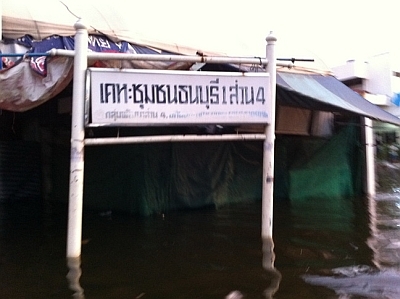 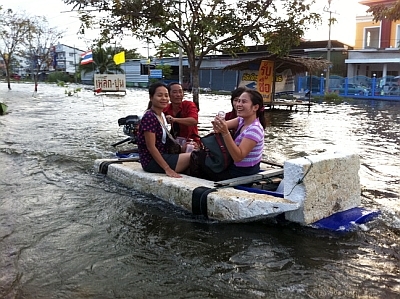 The water level was between 60 and 70 cm deep in the Evergreen City Village and around Bang Kruai. 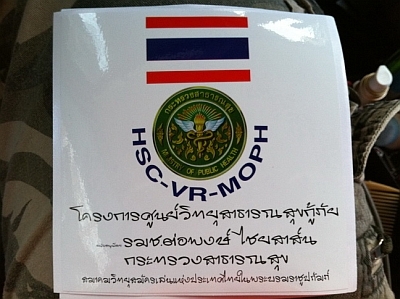 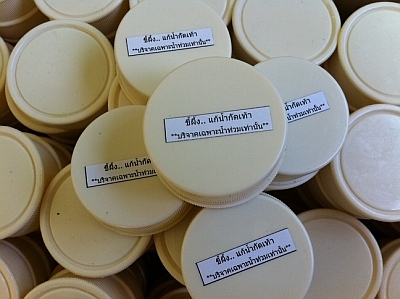 On November 18, Champ received five big boxes of medicine for distribution to flood victims from the Ministry of Public Health, delivered by Khun Wacharapol, HS4DDQ, and Khun Chakrawal (Lek) HS1ER. 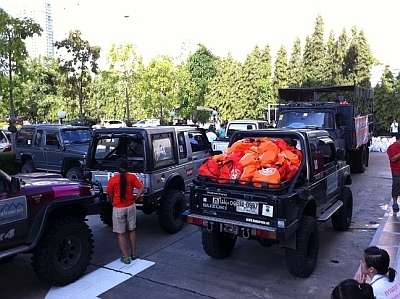 The volunteer spirit: There is no shortage of people joining the convoy of Sukuki 4x4s as they prepare to head out to help flood victims on the afternoon of November 16 when 1,200 boxes of food, drinking water and medicine were distributed. 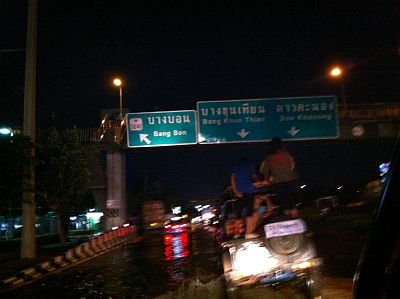 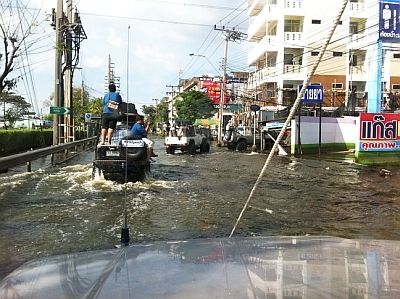 In Soi Kamnan Maen and Thoed Thai Road the water was 70 cm deep. 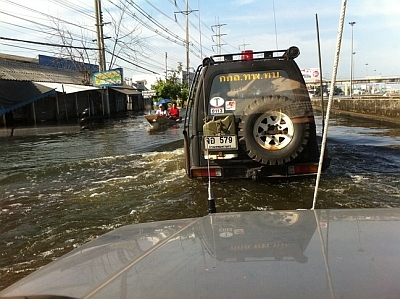 ... or on home-made rafts, such as this one... And the convey of intrepid 4x4s always receives a warm welcome (as can be seen above and below). 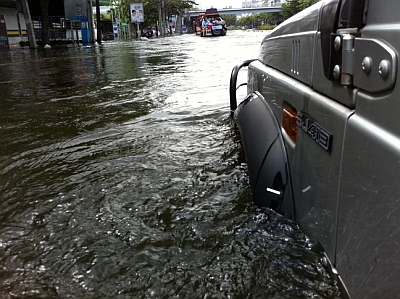 The water level was 70 to 95 cm deep. 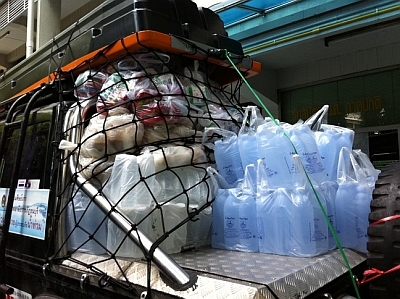 The team took 650 boxes of food, 1,000 bottles of drinking water and 100 suvival packs to help the flood victims. 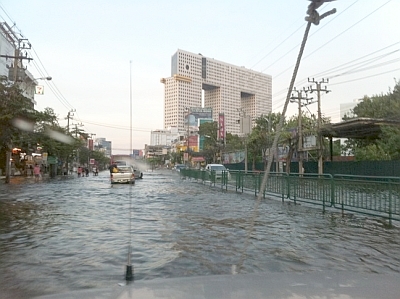 South of Rama 2 Road, the main highway to the south, has been badly flooded as flood water to the west of Bangkok seeks a route to the sea. 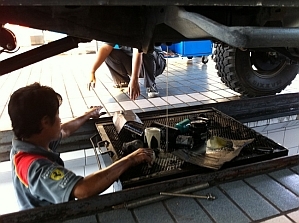 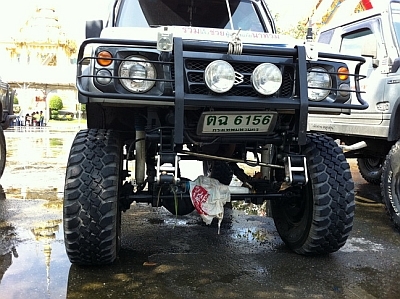 The Suzuki 4x4 convey takes a break at a flood refugee centre opened at the Bang Khun Thien sports stadium and Champ has concluded that he will change his gear oil tomorrow! 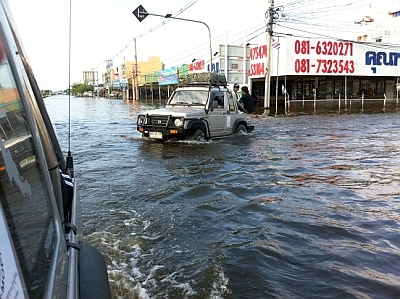 Driving in any vehicle through flood waters comes at a cost, at the very least for a change of oil for the differential (rear axle) and the gearbox. 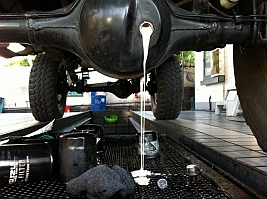 This is Champ's Suzuki 4x4 on the afternoon of November 15 and hopefully there has been no damage to the moving parts... here, the white emulsion of oil and water is drained before cleaning and its replacement with new oil. 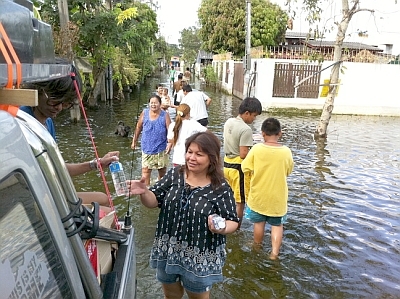 Champ, E21EIC reports that 1,000 boxes of food and 1,200 bottles of drinking water were distributed. 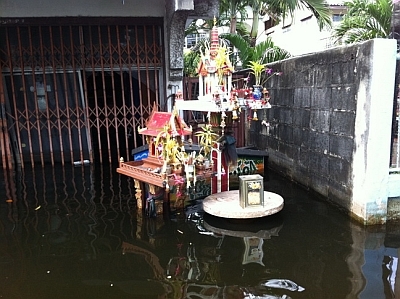 The water level in the Petchkasem area was 90 cm deep. 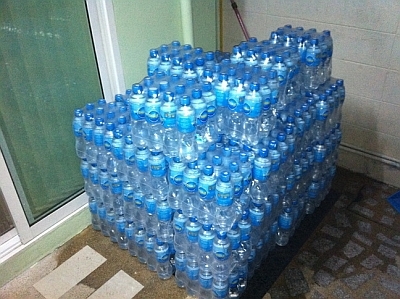 32 survival packs and 250 bottles of drinking water were distributed in the evening. 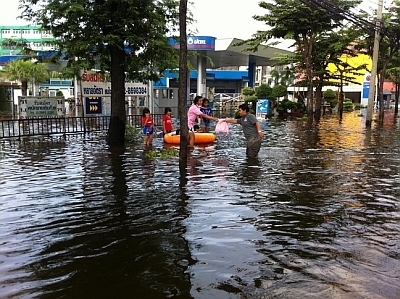 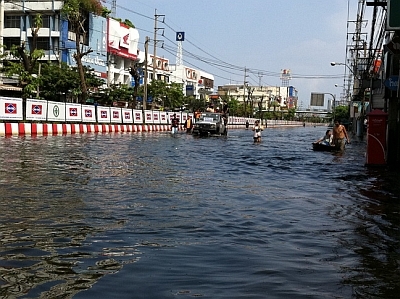 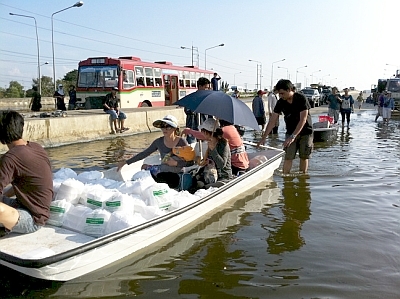 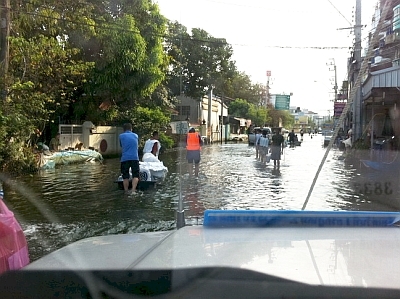 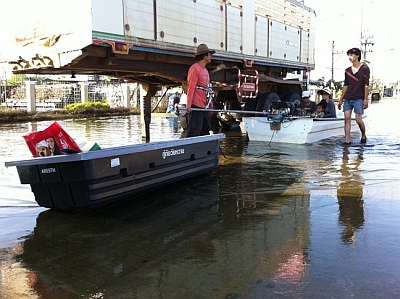 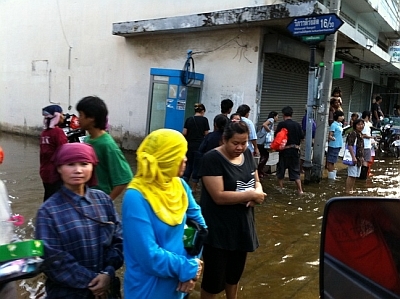 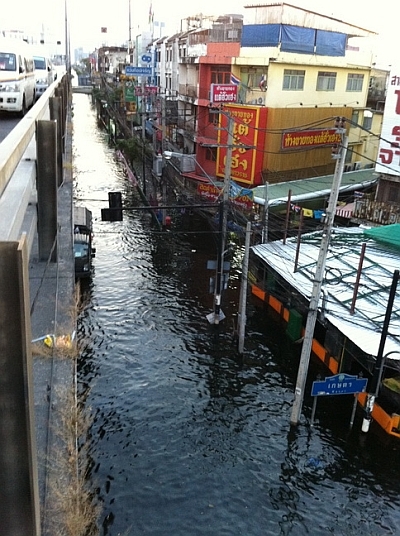 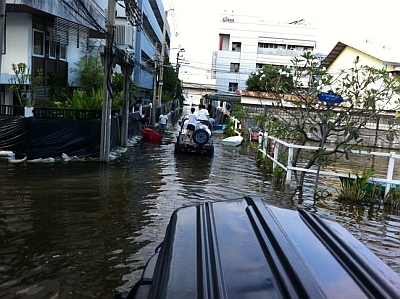 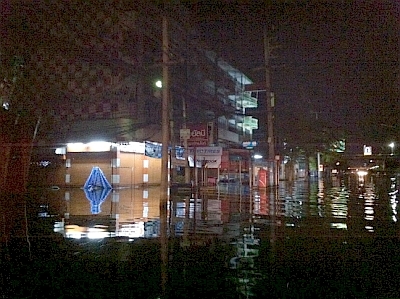 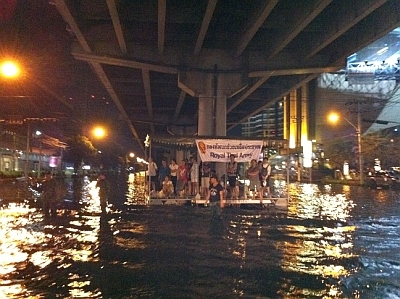 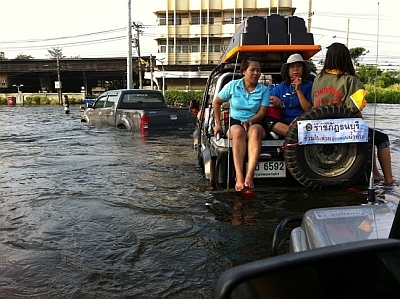 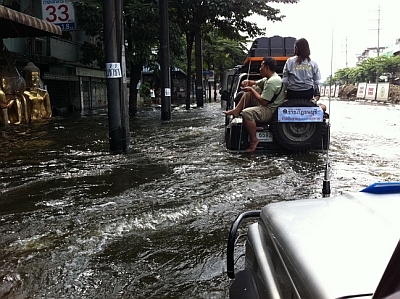 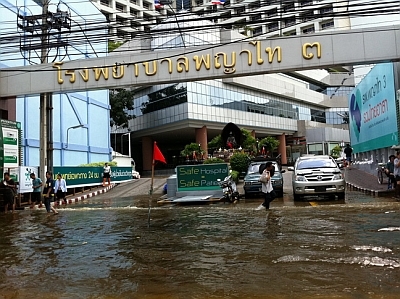 The water level was 50 to 70 cm deep in the Saphan Mai area. 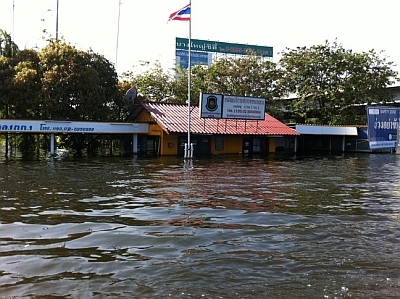 The Radio Amateur Society of Thailand under the patronage of His Majesty the King (RAST) is now using funds donated by members and friends of RAST to help flood victims by purchasing essential supplies to be distributed in areas inundated by flood water around Bangkok. 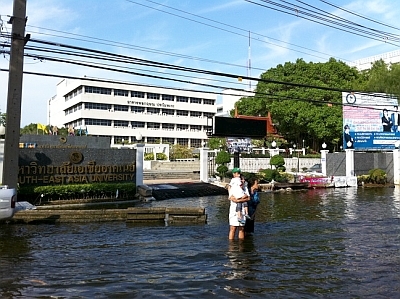 On October 15, RAST International Liaison Officer Tony Waltham, HS0ZDX sent an appeal to members by email seeking donations to help flood victims and over 50,000 baht has been received in bank transfers to the RAST savings account at the Krung Thai Bank (KTB), Pradipat Branch, Account Number 034-1-86101-4. 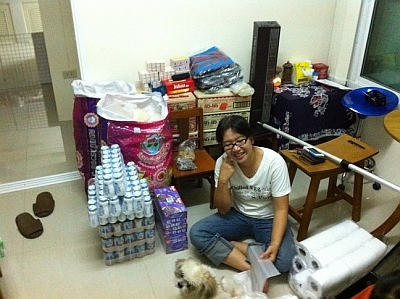 RAST President Chaiyong Wongwuticomjon, HS1QVD, would like to thank all donors for their generosity and, since the flood disaster is far from over, the society also welcomes any additional support to help the victims of this natural disaster. 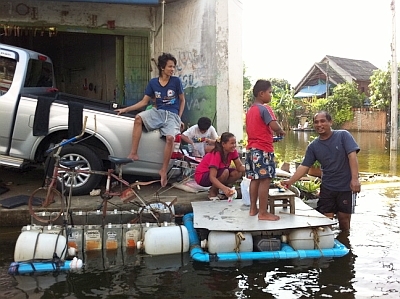 RAST will continue to distribute all funds donated to needy victims in the flooded areas in the manner depicted in the pictures below. 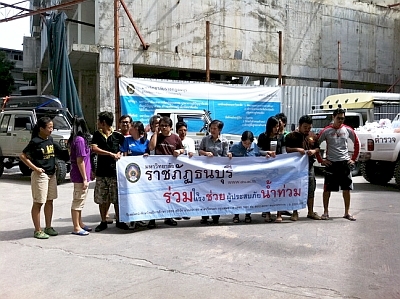 Any help or support is very much appreciated. 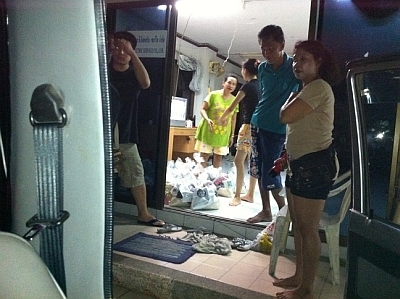 The work to prepare these survival packs seen in the pictures below is being carried out at the home QTH of RAST officer Chalermpol Muangamphun (Champ), E21EIC. 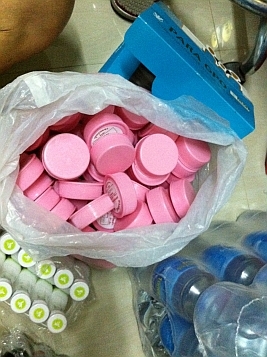 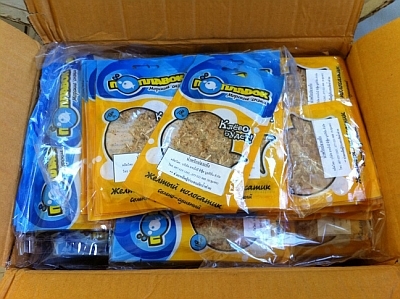 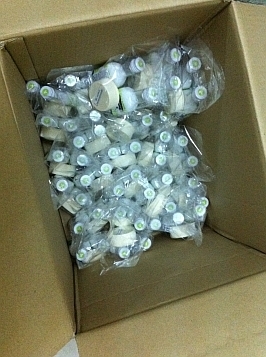 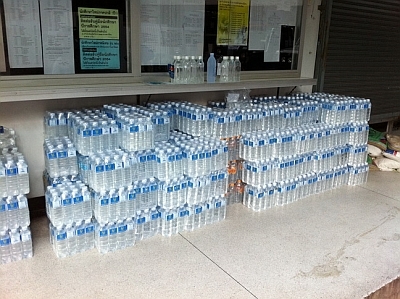 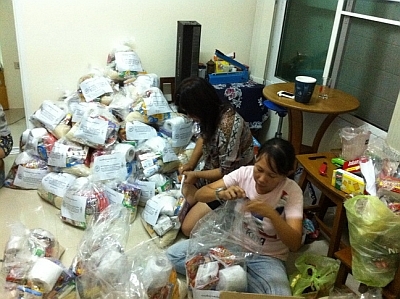 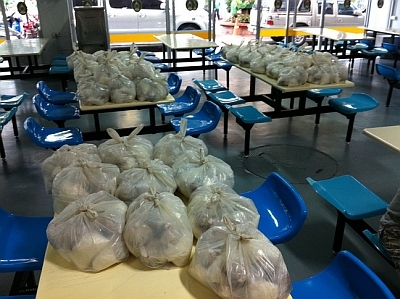 His team will be distributing the first 60 of these packages to flood victims on Tuesday, November 15, 2011. 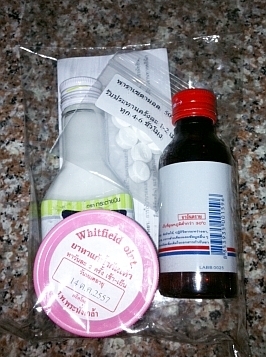 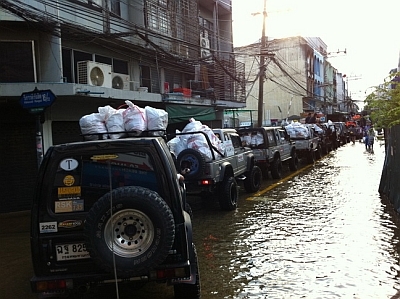 Champ reports that he has received three boxes of support from Tony, E21IZC, from his company in Chumphon, with 520 packs of Nam Prik and 800 packs of medication for feet that have been explosed to flood water (seen in the above photos) and he will be distributing these with the RAST survival packs. 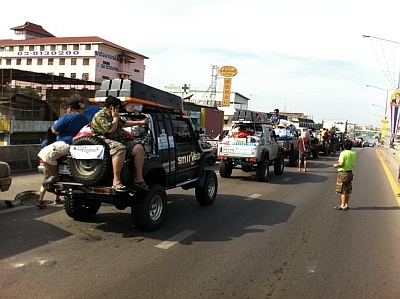 This was a convoy of 20 Suzuki 4x4 jeeps with big support from RAST, the Ministry of Public Health and volunteers. 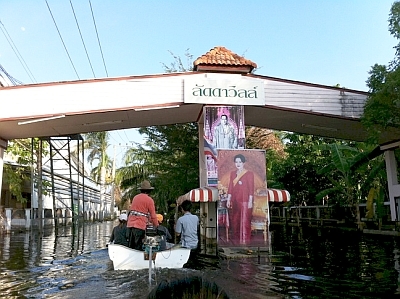 RAST Secretary Wacharapol, HS4DDQ, (seen above in both these photos) joined in with Champ, E21EIC, along with HS0WCM, E20TDP and E20NKB. 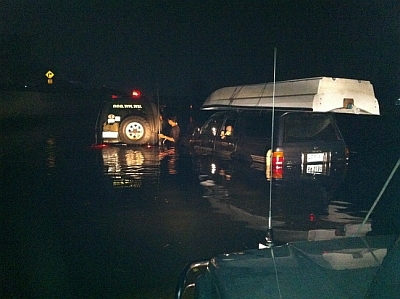 This expedition lasted for four hours during the afternoon and early evening of November 12. 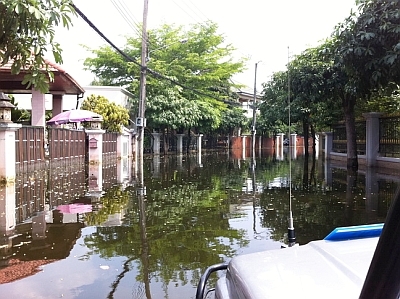 Petchkasem Road, the main road to Nakhon Pathom, has been inundated for over two weeks, but it is deep in the sois in this western Bangkok suburb that residents who have not evacuated their homes are suffering the most. 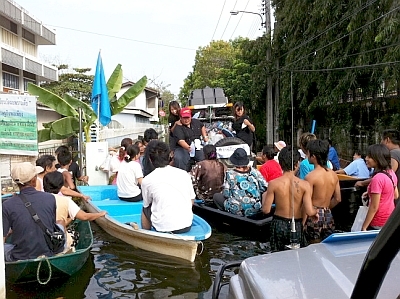 The water level in these sois was around 85 cm and 300 boxes of food and drinking water were distributed. 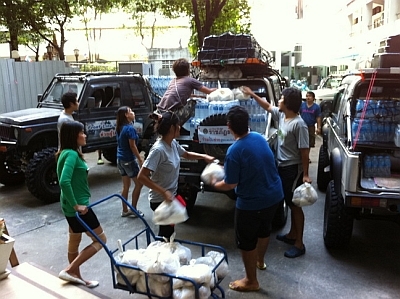 Champ, E21EIC, and Goi, E20NKB, and the team spent three hours distributing supplies that day. 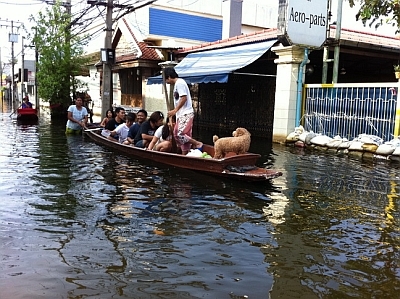 That's Champ navigating the boat at Suan Pak at left. 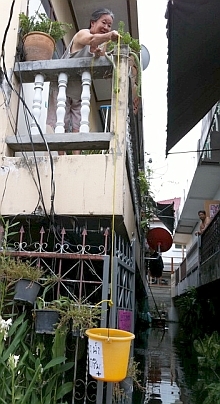 Before... and after... 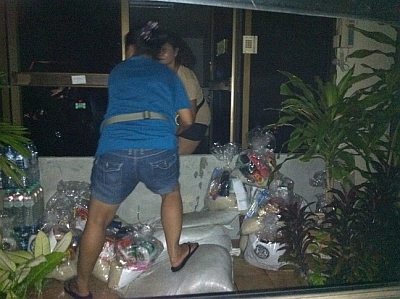 The photo at right was taken late in the evening after all deliveries of supplies had been completed. 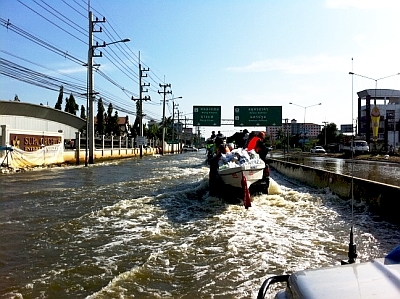 This expedition to the flooded areas of Chatujak, Lard Prao and Sai Mai was made by Champ and Goi following the RAST meeting at Sena Place Hotel on Sunday November 6, and the flooding began less than a kilometre away from the meeting place in Saphan Kwai. 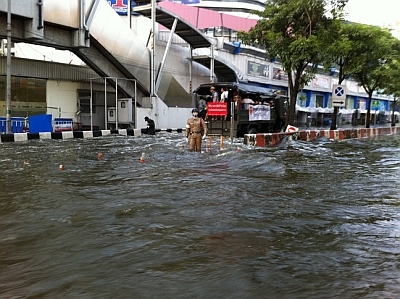 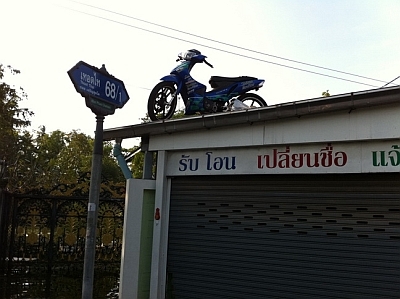 The pictures above show the Central Lard Prao intersection and, below, further north along Phaholyothin Road. 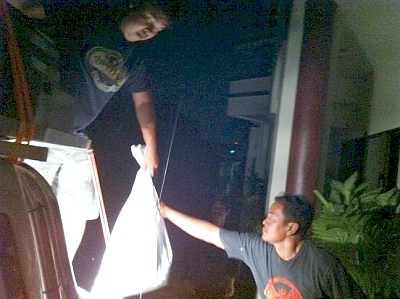 The delivery of supplies continued into the evening until all the stock had been distributed. 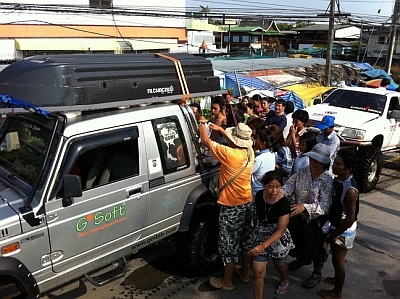 On November 15, a flood relief expedition will distribute supplies sponsored by RAST with the support of RAST members. 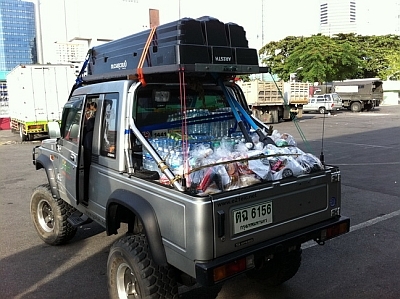 So far, over 50,000 baht has been received in donations and RAST is using this money to buy supplies that are to be distributed by Champ and his team in the flood-stricken areas of greater Bangkok. 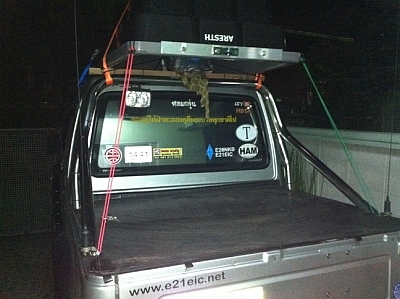 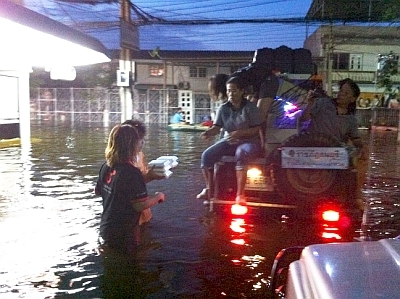 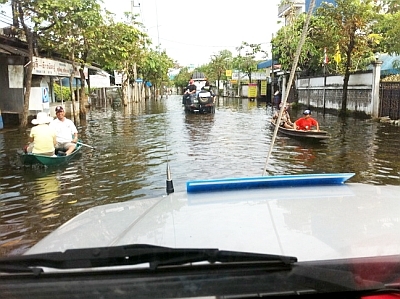 These pictures show the efforts by a group of radio hams led by Champ, E21EIC, and Goi, E20NKB, in their Suzuki 4x4 to help flood victims in Ban Bua Thong, Bang Yai and Sai Noi and Sai Yai in Bang Kluay in Nonthaburi Province to the northwest of Bangkok. 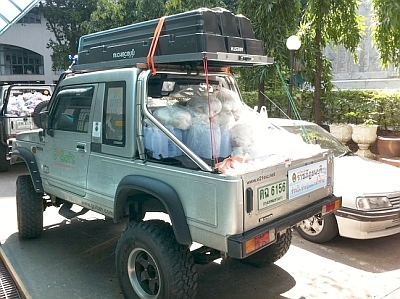 Also pitching in to help were Taweesak Srikeaw, HS0WCM (Dang), his XYL Jitbanjong E20TDP, (Nok) in another Suzuki 4x4 and Wacharaphol Wiengchai, HS4DDQ, the controller at HS0AC, the station that is working with the Public Health Ministry, helping to coordinate evacuations in the case of medical emergencies. 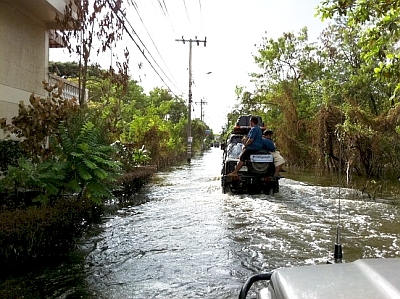 This foray into the flood stricken areas took place last week on November 4, when the flood water was between 80 cm and up to one metre in depth. 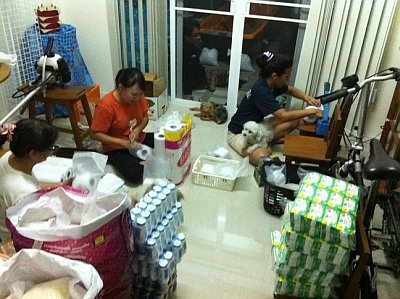 A total of 1,000 boxes of supplies and some dog food was distributed on this occasion. 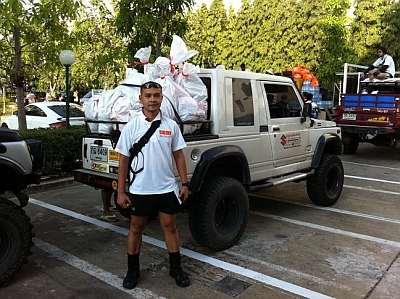 Champ and his team have been back since to distribute more supplies and the Radio Amateur Society of Thailand is using funds of over 50,000 baht received so far to sponsor relief supplies that will be distributed in the coming days and weeks. 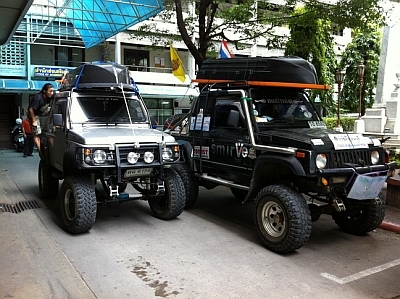 And please send details to Tony, HS0ZDX (tony.waltham[AT]gmail.com). 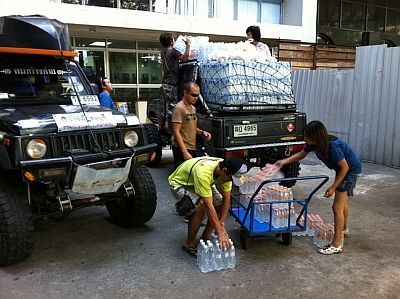 We thank everyone for their support in this time of crisis. 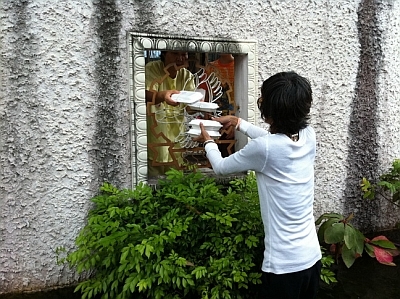 The photographs above are courtesy of Champ, E21EIC.